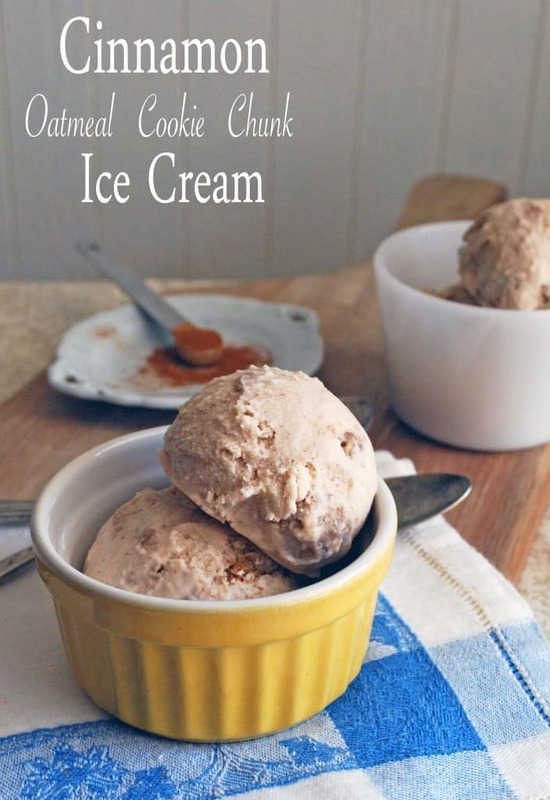 Cinnamon Oatmeal Cookie Chunk Ice Cream tastes just like the Ben & Jerry’s flavor! Let’s have a cookies and milk moment, shall we? There’s nothing better than dipping a warm cookie in a cold glass of milk. Unless, of course, you’re mixing that cookie into the richest milk infused with cinnamon and turning it into ice cream. Making homemade ice cream is a bit of a time an financial commitment (you’ll need an ice cream maker, I own this one), but totally worth it once you realize you can make any flavor you can imagine. Cherry crisp? Yep. Grape nut? You never knew you needed this so much. I don’t make a lot of homemade ice cream, but when I do I go all out. No boring vanilla one here! This is a copycat of my favorite Ben & Jerry’s flavor that is no longer available in stores. It’s milky, lightly spicy, and sweet. You don’t necessarily need the entire cookie recipe for the ice cream, although you’re welcome to because it’s one of my favorite parts! I like having the extra for snacking as I wait for the ice cream to freeze, crumbling on top of a sundae, or using it for ice cream sandwiches. I usually prefer a thick and creamy ice cream recipe, but this one is a little milkier which turns out great with the cookie bits. I’m also a major diva and can’t stand melted ice cream, except in this instance when it tastes like a sweet cinnamon cookie dream. Summer is already half over and I can’t even stand the thought of it. And no, I don’t go by the calendar year, I go by the school year, because how else should one measure time?? Still on my summer bucket list is a canoe/kayak adventure, a trip to the zoo, and taking a couple of the kids to their first huge water park. Oh, and coming up with more amazing ice cream flavors, obviously. 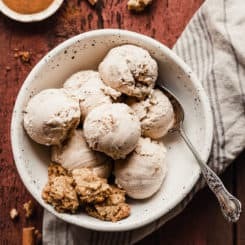 Spicy cinnamon and chewy oatmeal cookies make this ice cream irresistible! To make the cookie chunks, preheat the oven to 350ºF. 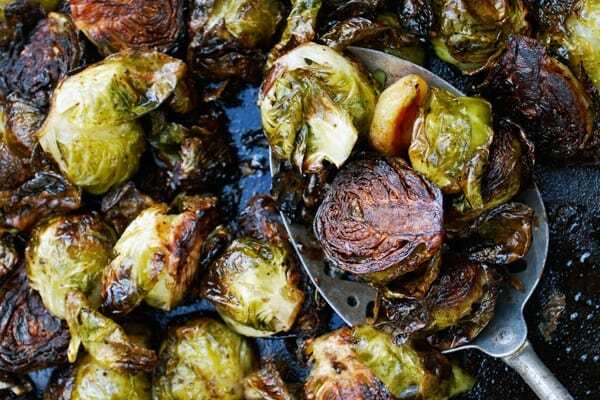 Line a baking sheet with a Silpat or parchment paper. and set aside. In the bowl of a stand mixer fitted with the paddle attachment, combine butter, brown sugar, and granulated sugar on medium speed until light and fluffy. Add the egg and vanilla and mix again until fully incorporated. Add the flour, baking soda, cinnamon, nutmeg, and salt and mix until just combined. Add the oats and pulse until just combined again. Spread the cookie dough in an even layer about 1/2 inch thick on the prepared baking sheet. Bake 11-13 minutes or until just starting to brown on the edges and set in the middle. Let cool completely on the baking sheet. 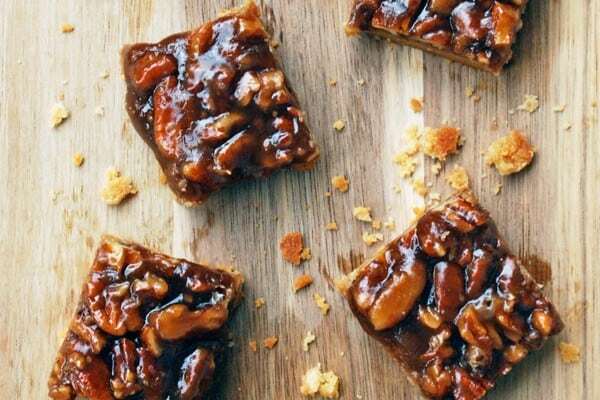 Break the cookie into bite sized chunks and transfer to a freezer safe container. Freeze until ready to incorporate into the ice cream base. To make the ice cream base, prepare an ice water bath and set aside. In a medium saucepan over medium heat, combine milk, sugar, maple syrup, and cinnamon. Cook, stirring occasionally, until the mixture just begins to foam around the edges and the sugar has dissolved, about ten minutes (do not boil). Add the cream, vanilla, and salt and stir to combine. Prop open a gallon size plastic freezer bag (I like to set it in a 4 cup glass measuring cup for stability). Pour the ice cream mixture into the freezer bag, remove most of the air, and seal. Settle the freezer bag in the ice water bath and allow to rest, massaging the bag once or twice, until cooled, about 30 minutes. Transfer the plastic freezer bag to the refrigerator (I return it to the glass measuring cup) and chill 1 hour or up to overnight. Stir the mixture slightly then pour into your ice cream maker and process according to manufacturer's instructions. 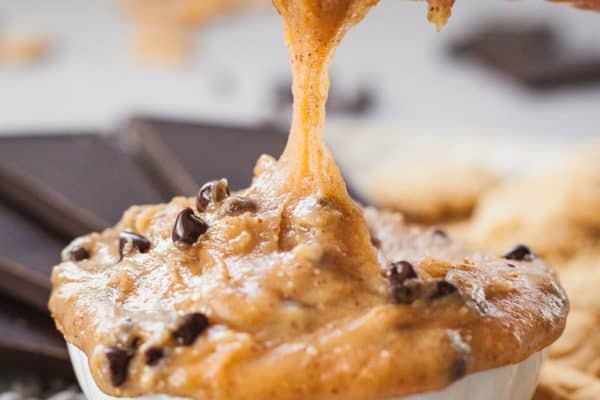 Add the frozen cookie chunks (I used about 3/4 of the cookie bites) in the last two minutes of churning or fold in gently with a spatula. Transfer the ice cream to an airtight container and freeze at least 1 hour and up to four days. Yum, your ice-cream sounds amazing! Your photos are making me long for an ice-cream maker! You should totally get one! I can’t believe how easy it is. Thanks for letting me know, I’m so glad you liked it! Oh wow Lindsay! This ice cream looks incredible! Your pictures are gorgeous!! I love cinnamon and oatmeal, putting them into ice cream was a great idea so i just had to include this in my ice cream round up. Happy Fourth of July! I love making ice cream but I’ve never made one this delicious! I am so craving this now! I need a scoop for a walk in this beautiful warm weather we’really finally having. Just what I was looking for! I’m going to try to make this recipe this weekend for a friend who is really really missing the Ben & Jerrys flavor! Can’t wait to try it 🙂 Thank you! I’m glad you enjoyed it! I definitely need to make it again now that it’s getting hot out! I’m drooling! What an amazing adaption! Thank you so much for the pingback. I’ve got to try this version ASAP!